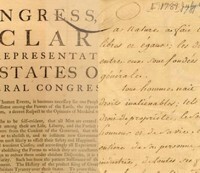 The Declarations of Independence Project is designed to explore an unprecedented range of documents related to the American Declaration of Independence, focusing on the period between 1776 and 1826. The goal of this pilot project is to gather together many of the declarations that were made in states and towns around the country and to provide scholars and students with access to a rich collection of otherwise inaccessible original materials. The site facilitates comparing and contrasting the documents, annotating materials, and sharing commentary. Conceptualizing ways to make original, handwritten documents available for scholarly research online. Further efforts may include creating mapping and timelining tools.